Notes prepared by Dan Dimancescu from original files and records of D. Dem Dimancescu, member of the Romanian Delegation at the Conference. Post-War border settlements were one of Romania's principal issues, especially on the Western frontier with Hungary which had been extended into Romania (Transylvania) during the pro-Nazi war-time regime of General Antonescu. 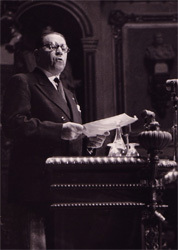 Hungary argued for control over several urban zones of major demographic and economic importance to Romania. On this issue Romania benefited from the Soviet Union's disfavor with Hungary's support of the Nazis while Romania, in 1944, had turned its armies against the German/Hungarian western military front and fought on the month-long siege of Budapest and beyond to Czechoslovakia. One was to establish the point at which it entered the war. Was it August 24, 1944, when King Michael aligned himself with Romania’s natural allies, or was it as proposed by others on September 12, 1944, at the moment when an armistice was signed in Moscow. It was successfully argued by the Romanian delegation that no less than 15 divisions and up to 18 totaling 385,000 men plus an air corps were engaged against Germany and its Hungarian-Horthyst allies during this interim period. From the 23rd of August to May 10, 1945, a period of 260 days, 12 divisions moved 1000 km into enemy territory. 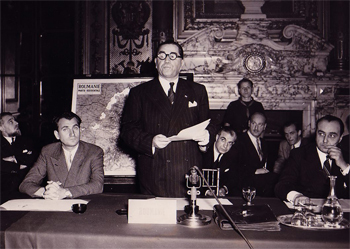 The earlier date was agreed to thereby giving Romania vital leverage in making post-war claims. A second was to argue for its pre-war borders including Bessarabia, Dobrogea and all of Transylvania. The first two were not successfully achieved because of Soviet opposition. But Hungarian territorial claims within Romanian territory [see Maps] were successfully resisted. 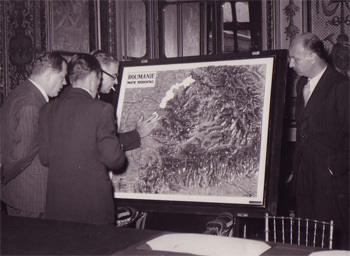 Those maps (prepared by D. Dimancescu) were a backdrop to a speech by Mr. G. Tatarescu [SEE photo] to the Political and Territorial Commission for Hungary & Romania. His speech was factual, emphatic, and successful in persuading the Commission to deny Hungary those claims. “The frontier of 1920 is an ethnic frontier. Its path coincides as perfectly as possible with the line of contact between the Romanian element and the Hungarian one. “If, on the borders, the infiltrations are greater and islets of Hungarian more numerous, it is due to the forcing back of the Romanian element away from the richer plains and into the poorer hills and mountain regions. The integration of these areas [see Maps] into the frontiers of the Romanian State is linked to the strengthening of the Romanian population’s economic development, empoverished long ago by design by the Hungarian regime. 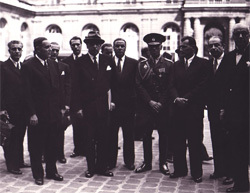 Signed in Paris on February 10, 1947, in the Salon de l’Horloge (Ministère des Affaires Étrangères) and concluded at 3:30 pm. Copies of the Peace Treaty texts are available.